Gerry Adams thinks Ireland needs "another Rising"
A peaceful one this time. THE SINN FÉIN leader has called for a peaceful Rising in Ireland. Gerry Adams told a 1916 commemoration in Fermanagh today that a revolution was needed to “take control of the Proclamation”. He said that partition of the island had “retarded and distorted” the social and economic life in both the Republic and Northern Ireland. 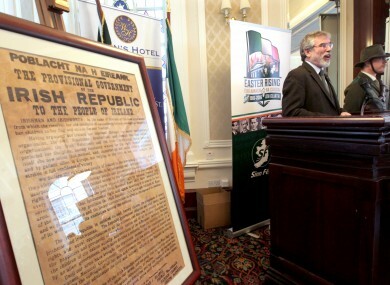 Adams added that his party wants a referendum on the unification of Ireland. “Many people now realise that that it makes no sense to have two economies, two education systems, two health systems, two tax codes, two currencies on one small island. “There is a growing recognition by the business community of the economic sense of an all-island economy with joined-up agriculture and health sectors. “The message of the Proclamation, the symbolism of our national flag and the challenge for republicans today is to unite Orange and Green in equality and mutual respect. I would appeal directly to working class unionists and loyalists to examine the economic and social price now being paid for the union.Austerity policies imposed by an Eton-educated English elite is no more in the interests of people of the Shankill Road than it is for residents of the Bogside. He said that the 1916 centenary will be a kicking-off point for a discussion on the issue of partition. “I believe next year’s centenary events should be a catalyst for a national conversation on these issues. Sinn Féin is committed to securing, in the time ahead, a referendum on Irish unity so that each and every one of us, working together, can build a new, dynamic country. Meanwhile in Dublin, the party’s deputy leader Mary Lou McDonald said that Adams’ comments to US TV station CBS, set to be aired tonight, were not said in a “flippant way”. She said that terrible injustices were “visited upon countless families”. Email “Gerry Adams thinks Ireland needs "another Rising"”. Feedback on “Gerry Adams thinks Ireland needs "another Rising"”.